The exercise above combines one-octave major scales using a ‘seven up and down’ pattern with a progression that could be called the two-bar ii-V-I or ‘short’ ii-V-I. Briefly, a major ii-V-I progression is a series of three seventh chords built off the second, fifth and first steps of a given major scale. Building seventh chords on these roots results in a succession of three qualities: a minor seventh chord, followed by a dominant seventh chord, followed by a major seventh chord. The exercise below shows a way of voicing these three chords in close harmony by using a rootless inversion of the middle chord of the progression (the V7). The ii-V-I progression can establish the tonic key of a tune or the arrival of a new key, or the end of a phrase or the entire tune. A ‘ii’ chord, as jazz players define it, does not necessarily have to be built of the second step of a tune’s major scale; in fact, any place in a chord progression where there is a minor 7th chord followed a dominant 7th chord with the roots moving up a perfect fourth is commonly referred to by jazz players as a ‘ii-V’. While the membership fees are reasonably priced, an implied requirement for being a member of the club is that one has access to a mode of transportation. Maybe there should be an informal musical organization called ‘The ii-V-I Club’, made up of aspiring and practicing jazz players who seek to learn the ii-V-I progression in all keys or expand their knowledge of it, and to learn tunes that use this important musical building block. If there were such a group, the voicings and scales above are one ‘vehicle’ that can take you through many tunes that are based on the ii-V-I progression – maybe not two hundred and fifty one tunes, but quite a few. Besides the list of tunes earlier in this post, more ii-V-I tunes can be found in the next post in this series, Take Three At A Time, which shows how to assemble a list of six tunes from The Real Book Volume One that take you through ii-V-Is in all keys. My posts Give It Up for The Root (position pattern)s! 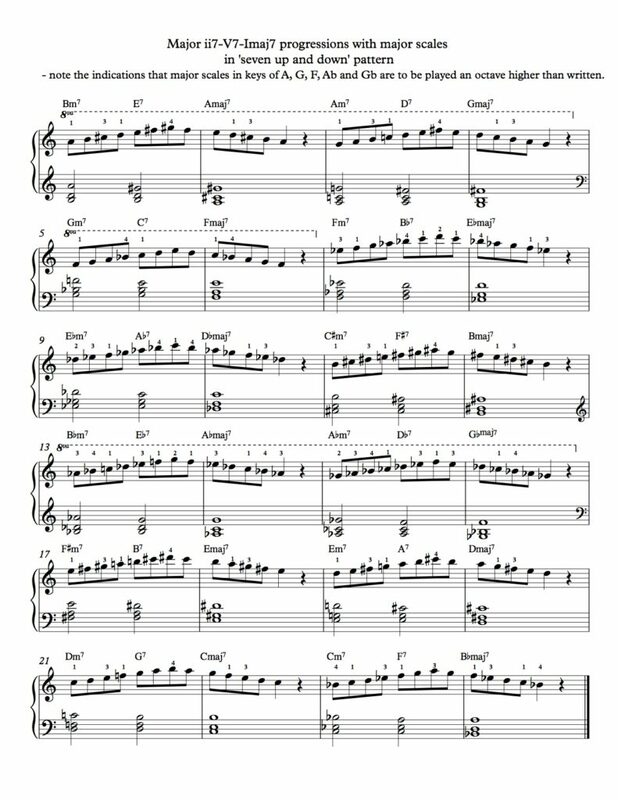 and Midnight Donna and Reets in Paris also show a number of one-bar ii-V and two-bar ii-V-I melodic patterns from bop tunes that are based on that progression. I wish you a happy, lifelong adventure through the byways of the jazz repertoire, full of lots listening and reading, and encourage you to prepare for the journey by learning the ii-V-I progression in all keys.